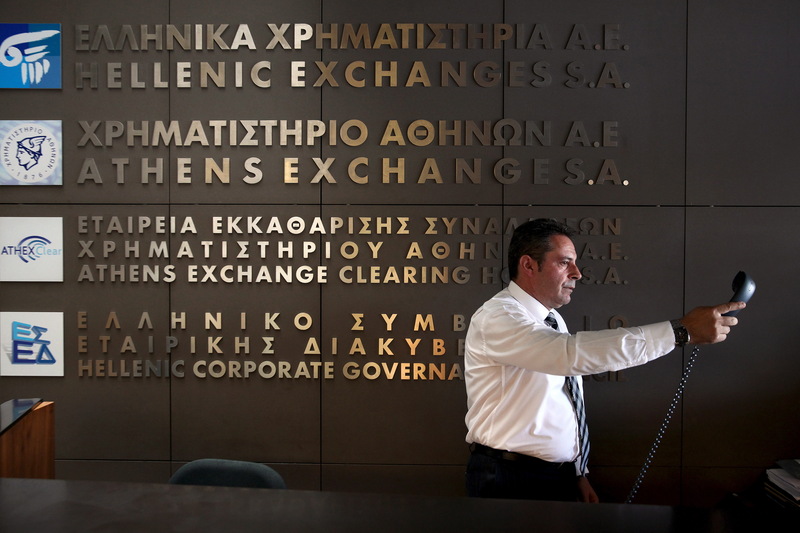 ATHENS, Greece - Greece's s stock market plunged over 22 percent as it reopened Monday after a five-week closure, giving investors their first opportunity since late June to react to the country's latest economic crisis. Bank shares suffered most, hitting or nearing the daily trading limit of a 30 percent loss. Markets in the rest of Europe, however, were largely unaffected. The stock market and banks were closed on June 29, when the government put limits on money withdrawals and transfers to keep a run on the banks from bringing down the financial system. Greeks were panicking over the prospect that the country could fall out of the euro after its talks creditors broke down. Greece has since then resumed talks with creditors and reopened its banks. Strict limits on cash withdrawals remain, however. Two surveys published Monday illustrate the extent of the damage wreaked on the Greek economy in July by the bank closures, money controls and general uncertainty over the country's future. Financial information company Markit said its gauge of manufacturing activity in Greece plummeted during the month to 30.2 points, its lowest ever reading, despite improvements across the rest of the 19-country eurozone. "Manufacturing output collapsed in July as the debt crisis came to a head," Markit economist Phil Smith said. "Factories faced a record drop in new orders and were often unable to acquire the inputs they needed, particularly from abroad, as bank closures and capital restrictions badly hampered normal business activity." Meanwhile, a monthly survey of business and consumer confidence, the Economic Sentiment Indicator, fell for a fifth consecutive month in July to its worst level since October 2012. "The negative development is the result of the sharp deterioration in business expectations in all areas, but also a recent and significant decline in consumer confidence," said the Foundation for Economic and Industrial Research, or IOBE, which conducts the survey. Greece is currently in intense negotiations with bailout lenders to negotiate the terms of a massive new rescue package in the next two weeks. The country needs to complete the talks and get more loans before Aug. 20, when it has to repay more than 3 billion euros to the European Central Bank. Deputy Finance Minister Dimitris Mardas did not comment on reports that Athens could seek a short-term loan to tide it over in case the talks have to be extended. "The (negotiation) timetable is truly pressing ... We are preparing for what has been agreed upon, correcting any gaps that may appear," Mardas told private Skai television. Negotiators from the European Union and International Monetary Fund are seeking faster cuts in early retirement plans set out by the government, and stricter conditions for a tax arrears payment program. Prime Minister Alexis Tsipras is facing opposition to the new bailout from within his left-wing Syriza party that could force him to call an early election in the fall. Syriza dissenters are openly calling for a return to the drachma, but failed last week to force an emergency party conference before the bailout negotiations are completed. "The government has to choose between a humiliating agreement to sign a third bailout, or abandon the agreements reached in Brussels and seek alternatives for a positive course out of this crisis," former welfare minister and prominent dissenter Dimitris Stratoulis said over the weekend.